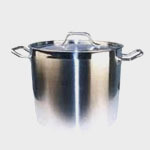 16 Qt S/S, Induction Ready Stock Pot & Cover Aluminum Sandwich Bottom!! 11" X 9.8"
24 qt. S/S Stock Pot & lid, induction ready, Aluminum Sandwich Bottom. 13 3/8" x 10 1/4"
32 qt. S/S Stock Pot And Lid, Induction Ready, Aluminum Snadwiched Bottom. 14 1/4" x 11 3/4"
40 qt. S/S Stock Pot & Lid, induction ready, aluminum sandwiched bottom! 15 3/4" x 11 7/8"
60 qt Stock Pot & Lid,induction ready, aluminum sandwiched bottom! 17 3/4" x 14 1/8"
S/S 8 Qt. Stock Pot and Lid. Induction Ready! !9.5" X 6.7" Beautiful, Heavy Stainless Steel Pot. Scour to your hearts content. This will not absorb any food acids such as Tomato sauce. Aluminum Sandwiched Bottom.